ARS is committed to the ideal of 'doing well by doing good,' and we understand that you can't truly be successful without purpose and integrity. 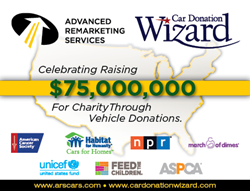 Advanced Remarketing Services Inc. (ARS), a leader in vehicle logistics and sales, is proud to announce that the company has raised over $75 million dollars for charity through the vehicle donation services of Car Donation Wizard™. Established in 2007, Advanced Remarketing Services is the most respected brand in the vehicle donation industry. Charity partners include: Habitat for Humanity International, The American Cancer Society, U.S. Fund for UNICEF, National Public Radio, March of Dimes, Feed The Children and several others. The ARS business model generates the highest value for each vehicle and the highest returns to the charity. Since the car donation program began, ARS returned over 82% of every gross dollar raised back to the charity. “Several of our employees have backgrounds in not for profit, we focused our programs on the charities needs and we know very well the kind of change that can be delivered with $75 million dollars,” said Hearn. At ARS, social responsibility doesn’t end with the dollars raised. Employees are encouraged to volunteer and give back to their communities. ARS employees consistently participate in fundraisers such as; the American Cancer Society’s Relay for Life, Habitat for Humanity home builds, pet adoption programs, food bank drives, toy collections and environmental campaigns. The vehicle donation process at cardonationwizard.com is fast, easy and always free. Donors are given full disclosure about how the donation process works and how much money is returned to the charity. Donors can donate cars, trucks, motorcycles, RVs, trailers and even boats. Located in Warren RI, Advanced Remarketing Services Inc. (ARS) manages Car Donation Wizard. ARS Inc. offers innovative automotive recycling and remarketing solutions for non-profit organizations, consumer markets and the insurance industry. To learn more about Car Donation Wizard, visit http://www.cardonationwizard.com or call 877-957-2277.